There are few phenomena in the history of fiction that have captivated the hearts and imaginations of as many people as Star Wars. For its fans, the universe that George Lucas created is as important as the one they live in. And the most iconic symbol of that universe is, of course, the lightsaber. So, when UltraSabers asked TNW to review one of its lightsabers I leapt at the chance to get one in my hands — if for no other reason than to pay respect to my inner child. Getting a lightsaber from UltraSabers isn’t so simple as just picking one out and ordering it. Don’t get me wrong – it can be, there’s nothing stopping you from just clicking on the first product you see on its website and ordering it. But if you really want the Jedi/Sith experience you can put together your own custom lightsaber from a myriad of options. Your design doesn’t have to be original — all the pieces are there to build the classics from the films. The ‘custom’ design I went with isn’t the most imaginative one. A ‘real’ Jedi or Sith would have put together a saber as unique and interesting as they are, I just went with the one I really wanted to play with. That’s what’s amazing about Star Wars: it’s deeply personal. It’s a dream-come-true for me to hold a replica of Anakin’s (also Luke’s) lightsaber in my hands, and that’s all I wanted from it. For me, this is a collectible. But your mileage may vary. 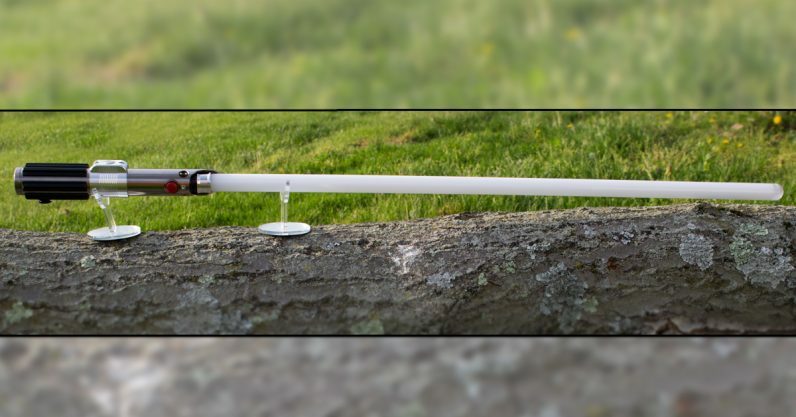 UltraSabers’ calls its product a “combat lightsaber,” and most of the faux-weapons it makes are designed to withstand use by live-action roleplayers (LARPers) or other Star Wars enthusiasts who actually spar with them. This means not only does UltraSabers make a great looking product, but also a solid and well-built one. My inner-engineer smiles every time I hold this thing because I’m amazed that none of its pieces have any shake or wiggle to them. It ‘feels’ better to wield than I thought it would, something I definitely attribute to it being designed for actual use. And it truly is a work of art. The attention to detail is fantastic: this isn’t a device designed to be comfortable or provide the best user experience, it’s just supposed to look the way I want it to. The only part of the device that can be manipulated is the single on/off button, but that doesn’t stop everyone who touches it from trying to mash the other decorative “buttons” on it, because it’s so convincingly made. I love the thick metal, solid plastic, and painstakingly recreated lines and grooves on the lightsabers’ hilt. In fact the only thing I don’t like about the saber is the plastic blade. Like the rest of the saber, it’s well-built and solid: but unless it’s turned on in a dark room it destroys any sense of immersion for me. Luckily it’s really easy to remove. 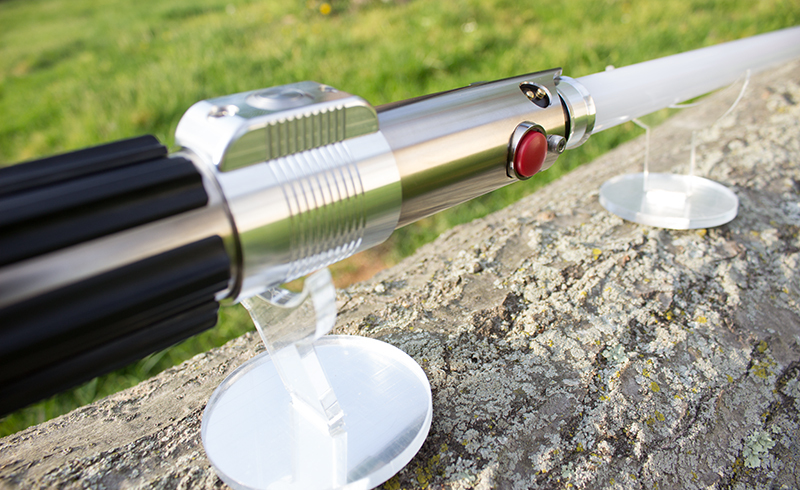 Based on my experience with just the Graflex CE hilt, I’m confident in recommending Ultrasabers’ products. But with any customizable gadget there’s always the risk that a particular design might not meet the same high-quality standards as another. And that brings us to the other important aspect of UltraSabers’ lightsabers: the price. To order the same options as the lightsaber in this review costs $353. An empty hilt can cost as little as $30, and Diamond Sabers as much as $600, all depending on which which model you choose. Whether or not it’s worth the money to buy a custom replica of a fictional weapon from a science fiction movie is completely up to you. But for my money, there’s no doubt whatsoever that it’s worth every penny for the nostalgia factor alone. If you want a lightsaber you can display and play with, I recommend UltraSabers’ for Jedi and Sith of all ages. The Next Web’s 2018 conference is almost here, and it’ll be 💥💥. Find out all about our tracks here.